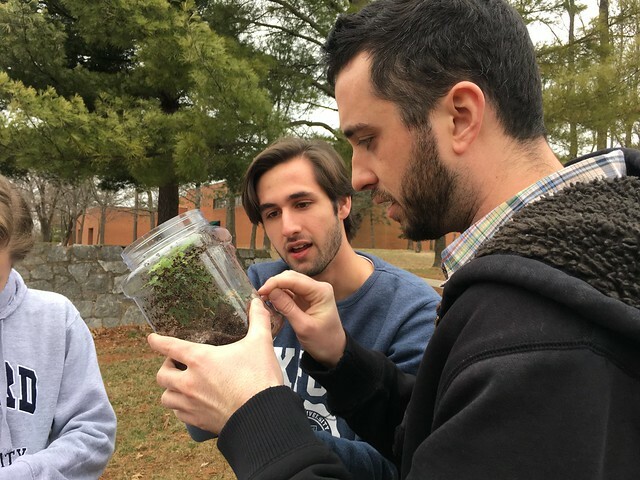 Mr. McLaughlin’s AP Environmental Science wrapped up a three-week project Thursday, learning about interconnected organisms in a closed system. The class divided into teams and challenged to design and construct a closed biosphere using plastic bottles and jars. Each team had access to a variety of soils, plants and small animals like fish, worms, snails and beetles, to create an ecologically-balanced environment that allowed all organisms to survive and reproduce. Initial selection of organisms and their counts is vital; if, for example, there are too many animals consuming oxygen and not enough plants producing it, the animals will die. The students chose their animal and plant organisms and constructed their “biobottles” using two-liter soda bottles, pretzel jars, and other plastic storage containers. Then they waited, with the only inputs to the biospheres being sunlight and room temperature. Today, they carried their projects outside to deconstruct and document the contents. Several teams saw success at the end of three weeks, documenting fish swimming and beetles foraging for food amid thriving plants both aquatic and soil-based. Other teams’ biobottles didn’t fare so well, with both organisims not surviving the experiment and resulting in a dark, gooey mess. (And none of the biospheres smelled good upon opening!) The organisms that lived found a new, happy home in Mr. McLaughlin’s classroom aquarium. The students had a great time comparing and contrasting their biobottles, discussing what worked and what didn’t. It was a wonderful classroom exercise that clearly demonstrates the delicate balance between life forms.